Well, as David correctly predicted, the hot weather stayed for the whole week and so it was excellent hay making weather. All cut and dried and turned and ready to bale by Thursday. It was all going so well. And then I got a call on Thursday morning from David to say that he was trying to limp the big tractor home as he had just had a major breakdown. Oh no ... sounded serious. Apparently he had to brake suddenly to miss a lorry that had appeared from nowhere on a narrow country road and the brakes had just blown apart. Unlike car brakes which are visible and fairly simple, tractor brakes are hugely complicated. They live inside the complex and huge rear axle of the tractor, inside the oil which lubricates the gearbox. So, anything coming apart can do some serious damage. Meanwhile, favours were called in from anyone who could help. One farmer went and rowed up the hay ready for baling. Another did the same in another field. Yet another came out and baled it all up for us. By Saturday night everything was baled and sitting waiting to be brought home. Phew! But that brings us to the next problem as the big tractor won't be fixed for a few more days. 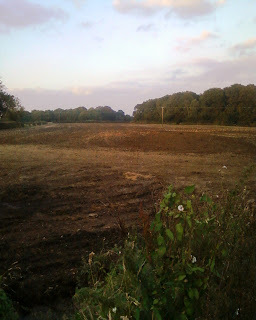 And rain is forecast .... Just have to hope that it holds off long enough for David to sort out some way of getting it all back to the farm and under cover. Back at the farm, away from the tractor trauma, all the mountains of goat poo have been spread, the new fields have been cultivated, the new grass seed sown and everything raked and rolled. Hurrah!! Just waiting for it to grow now ... I keep going out to see if there is any sign of green. I'm so impatient! 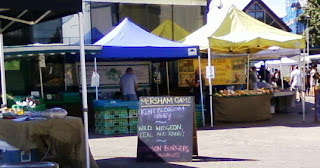 Balham market wasn't too bad yesterday though I think the glorious weather had taken a lot of people out of town. It was good to see Mersham Game back on the market - all that lovely game coming back into season. The goaties have been staying indoors during the heat of the day and venturing out into the field later in the afternoon when it gets a bit cooler. It was nice to see Betty and Wilma just chilling out on the far side of the barn. 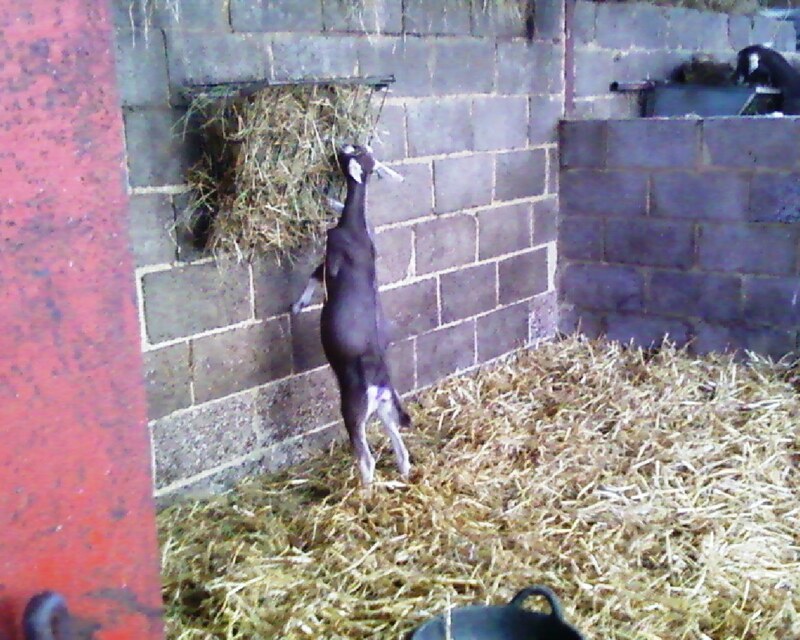 Along with their friend Ellie, Betty and Wilma were our very first goats. They are sisters and now over 8 years old. 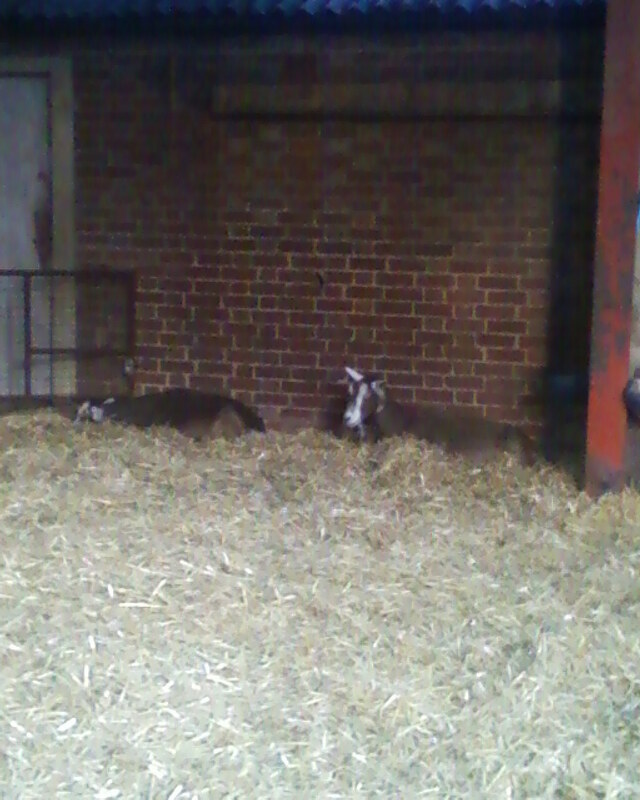 Unlike most of the other goats who have sisters, they don't tend to sit together and so this is quite an unusual photo. And how those babies are growing! Here's little Holly who is one of the youngest - she was born on 18th May. See how tall she is! And look at that big fat belly full of yummy hay! !